In 2011, Kingsley Aikins established Diaspora Matters, which focuses on providing advice and guidance to countries, regions and organisations. He has written and spoken extensively on the topic, and worked with over 20 countries. Running Networking Training Programmes for major corporations is an area he specialises in. Kingsley Aikins is the experienced and internationally recognized Diaspora expert with an extensive track record of working with countries, regions and organisations to help them engage with their Diasporas. Based on over 30 years working in the areas of trade and investment, philanthropy, education, culture, tourism and sport, Kingsley has developed a series of innovative and practical ways and methodologies in which countries can develop their Diaspora Capital. He has written and spoken extensively on the topic, and worked with over 20 countries. Running Networking Training Programmes for major corporations is an area he specialises in. Kingsley has developed a unique approach that revolves around a 4 step process of Research, Cultivation, Solicitation and Stewardship. He has produced a series of 15 videos that focus on the key elements of Networking. Clients of his Networking workshops include Google, Intel, Linkedin, Accenture, PwC, AIB, Towers Watson and UCD Smurfit MBA course. These programmes have been run in the US, Australia, UK and Ireland. Kingsley is a passionate believer that developing Networking skills will be a key differentiating factor in business in the 21st Century. Building on his experience in living and working with Diaspora projects in 6 countries and now based back in Ireland, he established Diaspora Matters in 2011 which focuses on providing advice and guidance to countries, regions and organisations. He has worked with organisations including the Irish Government, EU, GIZ (Germany), World Bank and IOM (International Organisation for Migration). In 2008, he wrote ‘A Comparative Review of International Diaspora strategies’ for the Irish Government. In 2011, he produced a Global Diaspora Strategies Toolkit which was launched at the Hillary Clinton Global Diaspora Forum in Washington at which he gave the keynote address. In 2013, he chaired the Global Diaspora Forum in Dublin, and in 2014, Diaspora Matters, with the Irish Department of Foreign Affairs and the Clinton Institute, hosted the Global Diaspora and Development Forum. In 1992, Kingsley was appointed President and CEO of the American Ireland Fund (AIF) based in Boston Massachusetts. The AIF was, and is, the largest Irish network in the world and is active in 39 cities in 13 countries with over 40,000 people attending more than 100 events annually. It raises money to support projects of Peace, Culture and Charity throughout the island of Ireland. In 1996, he was appointed President and CEO of the Worldwide Ireland Funds, still based in Boston, and established the Funds in new cities and countries. During his time with the Funds, over a quarter of a billion dollars was raised for 1200 projects in Ireland at no cost to the Irish government or taxpayer. The Ireland Funds became a model for Diaspora philanthropy and had a major impact on the Irish economy and non-profits and the Peace Process in Northern Ireland. During his time there, he ran the successful 5 year Hope and History Campaign to raise $100 million. In 2006, Kingsley returned to Dublin and continued as Worldwide CEO until 2010. In 2009, he produced a Philanthropy and Fundraising Toolkit and 101 Fundraising Tips. 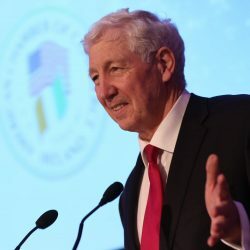 Kingsley Aikins joined the Irish Trade Board (the Irish Government’s export Trade Board promotion agency) in 1982 as a Marketing Advisor in the Consumer Products Division in Dublin and worked with Irish companies helping them develop strategies to enter export markets. In 1985, he was posted to Sydney, Australia as manager of the office there covering Australia and New Zealand. His job was to work with Irish exporting companies and help them penetrate the Australasian market. He also represented IDA Ireland, the inward investment agency responsible for attracting foreign companies to establish operations in Ireland and was successful in attracting a series of Australian companies to Ireland in software, financial services and manufacturing. While in Australia, he established the Australian Ireland Fund and also founded the Lansdowne Club, a business club for professional Irish people in Sydney, which became one of the largest Irish business networks in the world to this day. The Canning School, based in London, is a premier English language school teaching business English to European executives. He taught on these short courses and also helped market the courses to potential clients. As part of this, he spent 6 months working out of the Milan office of the Canning School. With an honours degree in Economics and Politics from Trinity College Dublin, Kingsley also speaks French and Spanish. He enjoys traveling, golf and music.